Very interesting indeed! Specifically putting this story during the Shadow War era is an very unexpected choice considering the suspect nature of just whether those stories actually happened or not. But considering the gimmick of the Convergence storyline, where Brainiac is able to move not only through space but also timelines, it doesn't take much mental gymnastics to assume that the Shadow War as depicted by Isabella, Richard Howell, et. al., took place in an alternate timeline. The creative team is the bigger story here. I know Jeff Parker mostly as a Marvel guy, and am passingly familiar with his Hulk work more than anything else. But the work of his which I have read has generally been pretty good. 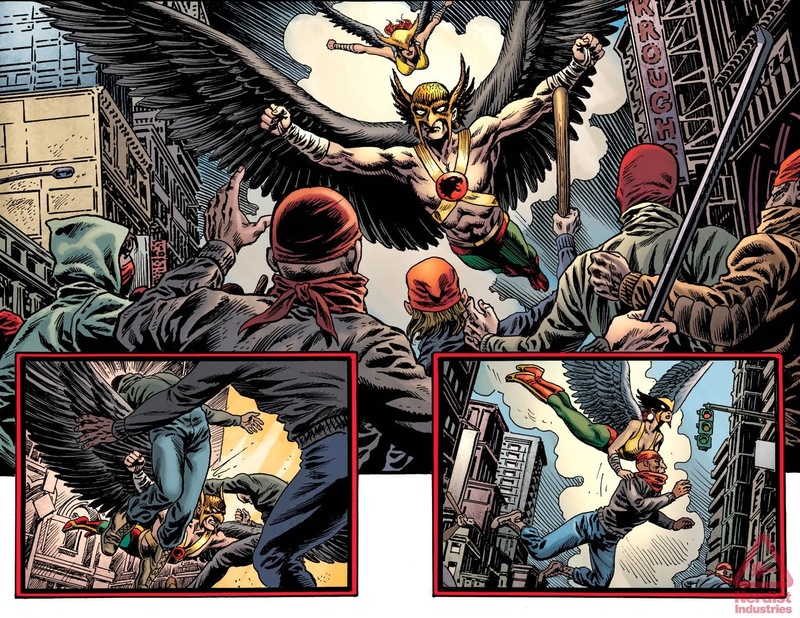 Not the first creator I would have pegged for a Shadow War-era Hawkman story, but I have faith that he is going to turn in something worth reading -- and the idea of him handling the Animal Men of the Kamandi timeline sounds like a blast considering, again, his work with monsters and savage characters from various Hulk stories. The art team is the one which will make long time Hawkfans sit up and take notice, though! Tim Truman and Enrique Alcatena are reunited from the original Hawkwold prestige format series, and the sample artwork looks amazing. Seeing them handling Katar and Shayera in their pre-Hawkworld uniforms is going to be a real treat for me considering how strong a stamp they put on the "Wingman" look. If nothing else, this series should be a treat to look at! So, what do you think? Looking forward to this little visit back to the days of the Shadow War courtesy of the art team from Hawkworld? Leave a comment and share! Image: Convergence: Hawkman artwork, 2014, Tim Truman, image retrieved from Newsarama.